Planning permission, also known as planning consent, is the formal permission from a local authority for the erection or alteration of a building, and it's something you'll almost certainly need if you're considering a major project – and may need if you're planning an extension or dramatic house renovation. It is also required for a change of use of buildings or land. Here, we take you through the essentials of planning permission. So, if you're extending a house or approaching a house renovation find out everything you need to know about planning permission. It is always worth checking with your local council to find out whether you need planning permission for your project, and what is likely to be accepted. You can also double check the government's planning portal to see restrictions. Currently, and in a bid to speed up the planning process, the maximum size allowed if you are planning and designing single storey extension has been doubled until May 2019. This means you can add an 8m extension to a detached house or a 6m extension to a detached property without planning permission. 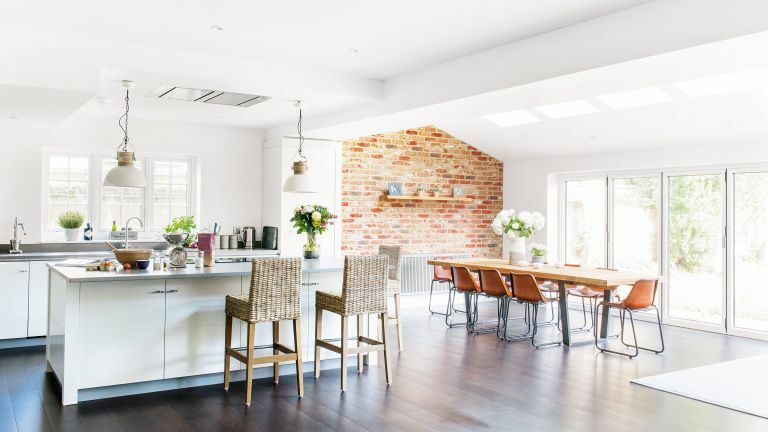 The relaxation of the planning rules can also mean that if you're planning and designing a double storey extension, you may also be able to extend without planning permission. This applies if, for example, your extension is no taller than the highest part of your existing roof; if it does not extend beyond the rear wall by more than 3m; if it is at least seven metres away from the boundary; and if it is built in materials to match the original structure. But, again, it's essential to check first with your local council first. However, flats and maisonettes do not fall under PD, so planning permission is required. Planning permission is also more likely to be required in conservation areas, National Parks and Areas of Outstanding Natural Beauty, but not in the Green Belt. Planning permission application fees vary depending on the nature of the application – you can use the government's planning portal to calculate costs. Welsh authorities have a different fee schedule, and applications for listed buildings or those in conservation areas don’t incur a fee. You’ll need planning permission for significant extension and remodelling projects, and you can apply either through your local authority or online through the planning portal. Follow our step by step guide to applying for planning permission to find out more. Local authorities will usually advise of a target determination date when validating your application. For small-scale projects, they normally aim for eight weeks from validation to decision. As a general rule, and unless stated otherwise in the letter notifying you of the decision, three years. This means that you should start work within that three-year window, or you will need to re-apply. If you’re lucky to receive an approval for your planning application, be sure to make note of the conditions attached, as they are just as important. Most approved applications come with notes, such as requiring the local authority to approve the exterior materials before commencement of work, or perhaps having sign off on a landscaping scheme. You’ll need to formally apply to discharge these conditions and receive a letter to confirm so, as failure to do this will invalidate your approval. You may need to tweak your design after gaining approval, for which you have two options: either use the minor amendments route, which is designed for issues like new window positions, or submit a new planning application. Avoid this by studying your plans in detail and have a physical or digital model created to help with visualisation. If the changes are very slight, it is possible to apply for a 'non-material amendment', but significant changes, such as the extension's overall height or the position of upstairs windows, for example, would be judged as 'material', meaning planners would have to advertise your plans again, in which case you may need to submit a new application. The minor amendment route costs £28 and takes 28 days to decide, while another full planning application would take eight weeks but is free if applied for within a year of the original. What if the planning application is turned down? ‘First, it’s important to try to understand exactly why the planning application was rejected,’ says architect Hugo Tugman. ‘The proposals may be largely acceptable, but simply contain a detail that the local authority can’t approve, in which case resubmitting a new application that has been amended accordingly should be enough to get the permission that you require. ‘It may, however, be that what you are proposing is fundamentally outside the planning policy or guidance the planners are working with. If that is the case, you really need to understand what these policies are and redesign so that your scheme falls within these parameters. These are legal agreements that run alongside some planning applications. They allow local authorities to secure monetary contributions to offset the impact of the proposal or control restrictions on the planning consent being sought. Normally, Section 106 agreements are reserved for larger applications, however, some local authorities are now using them to secure affordable housing contributions for developments of single plots, so it’s worth checking the local policy. Will a tree preservation order be a problem? It would be advisable to contact the council to ascertain whether the tree has a preservation order on it. If you are in a conservation area, you will also need to get special consent. Most planning decisions should take no longer than eight weeks from the point of application. If you think you are going to get a refusal, you can withdraw your application at any time up to the day itself, and resubmit free of charge. You can submit an infinite number of planning applications on any one site — and choose which to use, as long as it is current. You can make an application on any piece of land in the country, without having to own it. If you are certain that your project does not need planning permission, but want to be able to prove it is lawful in future – perhaps when you're moving house – it is worth applying to your local authority for a certificate of lawful development. An application needs to be submitted to your local authority. The forms are typically the same across all local authorities and can be accessed, completed and uploaded via planningportal.co.uk. You will need to submit scaled plans of your proposal and a location plan based on an up-to-date ordnance survey map.